Discover how doctors determine whether your sinus infection is viral or bacterial. And learn four practical steps you can take to ease your symptoms. You know the symptoms: nasal congestion, facial pressure, pain, fever, too much mucus. Ugh. It’s probably another sinus infection. But is your infection caused by a virus or bacteria — and does it really matter? It does, says otolaryngologist Raj Sindwani, MD. Doctors treat viral and bacterial sinus infections differently. Here is what you need to know about both kinds of infection and how to treat them. Most sinus infections are viral. How can you tell, based on symptoms, whether your infection is viral or bacterial? “You can’t,” says Dr. Sindwani. Instead, your doctor looks at symptom duration to determine the source of your infection. A viral sinus infection will usually start to improve after five to seven days. 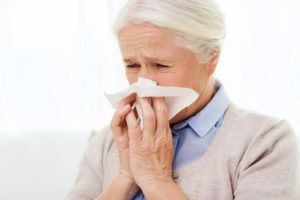 A bacterial sinus infection will often persist for seven to 10 days or longer, and may actually worsen after seven days. Use saline spray two to three times per day in each nostril. Use a nasal decongestant such as Afrin®, but not longer than three days. Drink eight 8-ounce glasses of fluid per day. If your symptoms aren’t improving after one week, it’s important to see your doctor. If your doctor suspects a bacterial infection, you’ll probably need to take an antibiotic to clear up the infection and prevent further complications. Note: Antibiotics won’t help a viral infection, and taking an antibiotic unnecessarily can do more harm than good. You risk possible side effects and increase your chances of developing antibiotic resistance, which can make future infections harder to treat, says Dr. Sindwani. So it’s important to wait and see how long your symptoms last. 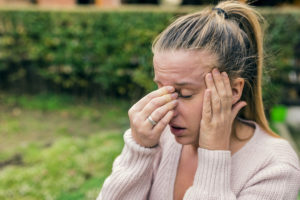 If you’re suffering from chronic sinusitis (nasal congestion, drainage, facial pain/pressure, and a decreased sense of smell lasting 12 weeks or longer) you should see your doctor, says Dr. Sindwani. Your doctor will swab your nose to collect mucus. Culturing it in a laboratory will reveal which type of bacteria is causing the infection so the right antibiotic can be prescribed. Treat early sinus infection symptoms with rest, hydration and over-the-counter sprays and decongestants. But don’t look for an antibiotic unless your illness extends beyond a week, he says. Then check in with your doctor for a prescription and let him or her know if your condition worsens.